Enlivened By A Free-For-All: This scene at Madison Square Garden on this night in 1937. While the Leafs’ Turk Broda watches from the comfort of his crease, policemen try to quell the second-period uprising. That’s Sweeney Schriner with a patrolman at lower left, as New York goaltender Alfie Moore looks on, with referee Mickey Ion nearby. The Amerks’ Roger Jenkins, wearing 10 in white, does his best to restrain a Leaf who’s swinging at Hap Emms, 15. Joe Lamb is 14 in the foreground; I don’t know that I can see Red Horner. But the Conacher news was bad. As it turned out, he’d still be recovering come late February of 1937 when the Leafs welcomed the New York Americans to Maple Leaf Gardens. Rivals in the NHL’s four-team Canadian Division, they were battling for the last playoff spot. This was a Saturday night, and the Leafs won 4-3, which put them nine points ahead of Red Dutton’s team. Catching a train after the game, the two teams headed for a return date in New York the following night — 81 years ago tonight. With a glad whoop, the crowd egged them on. Americans streamed on to the ice, a silent but bland Dutton holding the dasher door wide open, lest his janissaries be delayed even a split second. Connie Smythe, the mercurial Leaf pilot, ran out on the ice, thereby making himself very illegal though not felonious. It developed that Connie for once was not bent upon leading his cohorts into a battle-royal. He simply wanted to coax the angry Horner off the ice before his team in the Polyclinic Hospital or the W. 47th St. police station. Policemen, as you can see, did intervene. 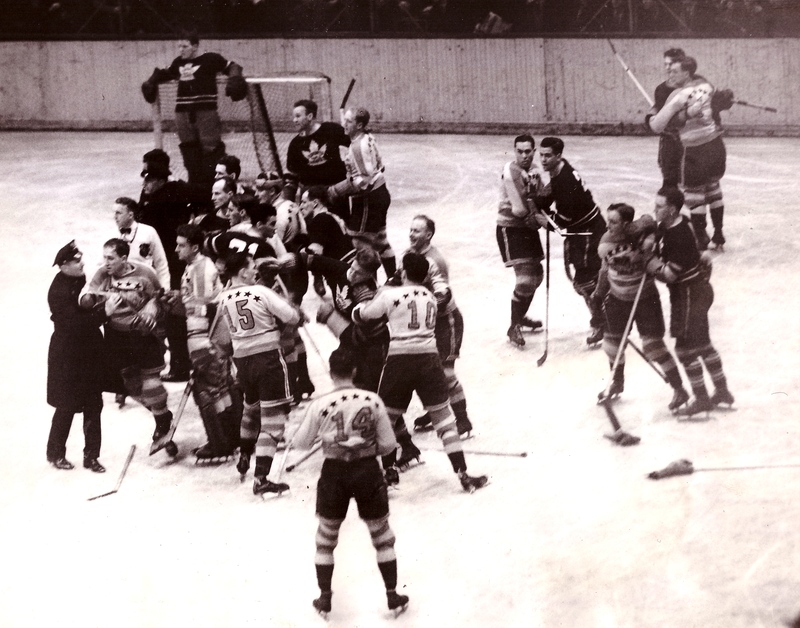 Fifteen minutes the affray went on, with everybody but goaltenders Broda and New York’s Alfie Moore joining in. 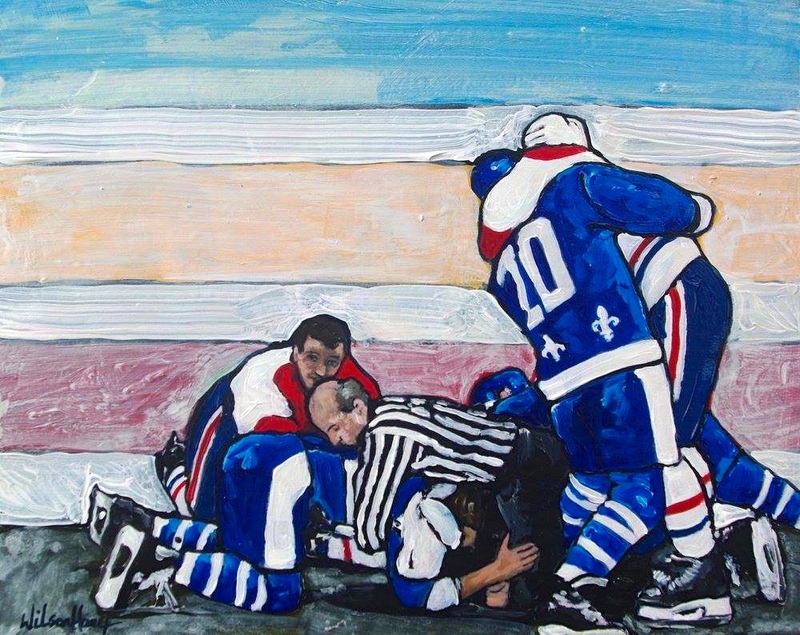 “Amerks and Leafs paired off,” Currie reported, “and looked with an elegant bellicosity at each other but swapped only menacing gestures and tall words” before something like peace was restored. Aftermath: Headline from the sports pages of a St. Louis newspaper, February 23, 1937. When it came to doling out penalties, Mickey Ion went with the simplest math he could muster: Horner and Lamb each got 20 minutes and a game, meaning they were banished and the teams had to play four-on-four for the duration of a period. Everybody else was forgiven their sins. And, I guess, simmered down: Ion called no more penalties for the rest of the night. Emms scored on his penalty shot, and teammates Eddie Wiseman and Sweeney Schriner later followed his lead, giving the home team a 3-1 win. The Americans didn’t make it into the playoffs that year, and while the Leafs did, they were gone in two games, losing to the New York Rangers. Although Joe Lamb put plenty of weight behind his stick when he walloped “Red” Horner Sunday night, Horner doesn’t look a bit the worse for it. “Red” always could take it. The Leafs say the only thing wrong with the crack “Red” took at Lamb was that it wasn’t half hard enough. Lamb doesn’t rate very highly in their popularity league. A version of this post appeared on page 132 of The Story of Canada in 150 Objects, published jointly by Canadian Geographic and The Walrus in January of 2017. Reggie Fleming’s brain made its NHL debut somewhere in the middle of January of 1967. That, at least, is how the newspapers framed it. By then, at age 30, six full seasons into his professional hockey career, Fleming knew the league’s penalty boxes better than its nets. He was a policeman, in the parlance, valued for his strength, bravado and professional surliness. Born with a black eye, a wag in the press wrote in 1961. He was a knuckleman, a bulldozer, a wild bucko. Reviews of his work are filled with references to his truculence and fistic prowess, his battle-scarred face. But here was Emile Francis telling reporters that Fleming’s brain had caught up with his brawn. He wasn’t taking foolish penalties, only wise ones; he was scoring goals. “He’s playing it real smart,” said the coach of Fleming’s New York Rangers. The truth is, Fleming could always play. He was just very, very good at being (as another chronicler put it) “one of hockey’s most brutal, meanest players.” Like hockey fighters before and since, Fleming was a beloved figure to teammates and fans alike, and much nicknamed: Reg The Ruffian, The Horse, Mr. Clean, Hardrock. Once he retired from the game, Fleming and his wild years might have lapsed into the background, the way the careers of workaday players do, enshrined on hockey cards and in the fond dimming memories of those who saw him play. Something else happened. When he died in 2009, his family donated his brain for study by pathologists in Boston. What they discovered was a shock to both those who loved him and to the hockey world he’d inhabited for all his skating years. It not only shifted Fleming’s legacy, but it transformed — and continues to transform — the conversation about the calamitous toll hockey can take on those who play. If for some sinister reason you had to invent from scratch a comprehensive system for putting the human brain at risk, hockey might be what you’d conjure. The speed of the game, its accelerations and sudden stops, the potential for impacts in unyielding ice and boards, all those weaponized sticks and fists and elbows — just how is an innocent mass of neural tissue afloat in cerebrospinal fluid supposed to protect itself? For much of the game’s history, guarding the head wasn’t exactly a priority. Toronto Maple Leafs’ star winger Ace Bailey underwent two brain surgeries in 1933 when he was knocked to the ice in Boston; he survived, though he never played again. Scared, many of his fellow NHLers donned helmets after that. Most of them soon vanished: they were cumbersome, hot. Even when they started to make a comeback in the late 1960s, hockey’s protocol for concussion cases remained simple: Got your bell rung? Shake it off, get back out there. Dr. Martland was the first to propose that repeated blows to the head were doing deeper damages within fighter’s heads, and that it was cumulative, causing “multiple concussion hemorrhages in the deeper portions of the cerebrum.” His conclusions on “punch drunk” syndrome were limited — he may have been circumscribed, too, by the outrage he stirred among fight fans annoyed by his medical meddling in a sport they loved so well. Reggie Fleming didn’t mind talking about the role he played on the ice. He was open, affable — “a soft-spoken, mild-mannered quipster,” one interviewer wrote. Born in 1936 into a large Catholic family in east-end Montreal, he first stirred tempers as a star for the Junior Canadiens. His mother hated to watch. Seeing his cuts, the blood he wore home from games, she wanted to talk to coach Sam Pollock. Her son told her no. That’s my job, he told her, the only way I’ll make it. 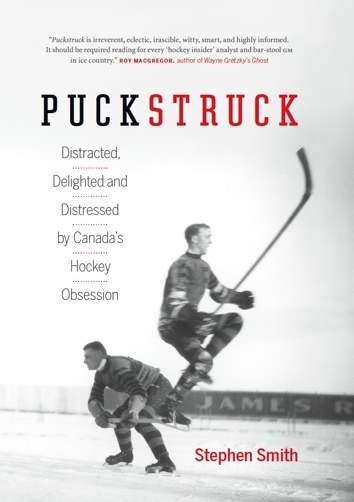 Pollock went on to a management job with the big-league Canadiens, and Fleming eventually followed him there, first as a fill-in defenceman, always as a willing warrior when a teammate wanted revenging, or Canadiens felt a need to send one of hockey’s proverbial messages to their opponents. Although I guess there’s such a thing as message overload — as the story goes, Pollock traded Fleming to Chicago in the summer of 1960 after he roughed up a couple of teammates in practice. Got To Knock Them Down: Reggie Fleming as a Hawk, c. the early 1960s. His time in penalty boxes would eventually tick up to total 1,468 career minutes, or just over 24 hours. The websites that archive and revel in hockey’s fights don’t have a good fix on just how many he fought: at least 69, but maybe 96, almost certainly many more. Still, he was relatively restrained compared to some of his heirs, the fearsome likes of Tie Domi (338 fights in 1,020 games) or Bob Probert (302 in 935). A ledger of the punishments he dispensed and received during his career isn’t hard to coax out of the newspaper archives. There’s a whole angry thesaurus of NHL violence in there: Fleming struck Jack McCartan with a vicious right (1960), slugged Wally Boyer (1969). The NHL fined him $175 for charging a referee (1964). Other uproars he sparked by swiping a goalie (1967) and trying to cross-check Bobby Hull’s face (1972). Eddie Shack clotheslined Fleming with his stick (1964), sending him to hospital with a concussion and cuts that needed 21 stitches to close. He was incoherent when he left the rink, the papers reported. 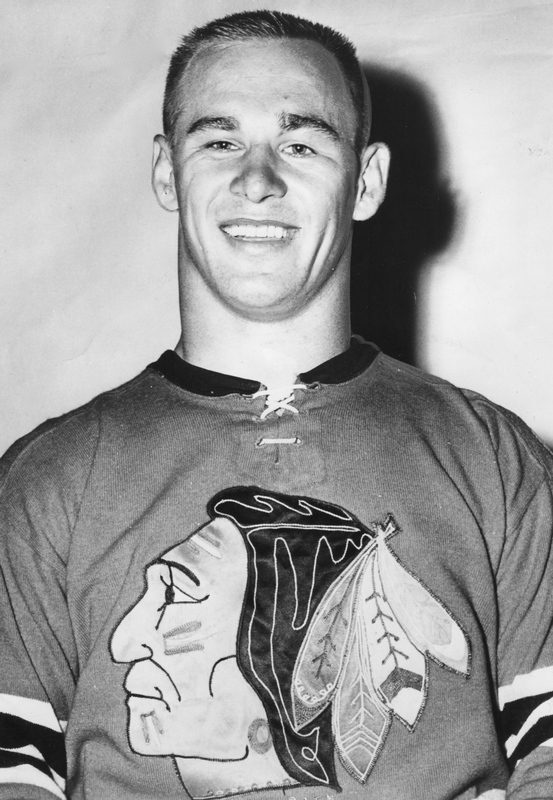 Fleming was a proficient penalty-killer, too, and he was a key asset of Chicago’s when they won the 1961 Stanley Cup. One year, in Boston, he found the net 18 times. Let’s remember this, first: when Joey Kocur played in the NHL, he was a crossword king. Teammate Darren McCarty said Kocur was the best he ever saw when it came to wordy puzzles. USA Today, New York Times, didn’t matter, he’d zip through them all. “He was amazing,” McCarty writes in My Last Fight, a 2014 memoir. McCarty does acknowledge that as a hockey player, it wasn’t for wordplay that Kocur was so widely feared. One of McCarty’s first fights as a rookie for Detroit was with Kocur, then a Ranger, before they became teammates. “One of his punches cracked my helmet,” McCarty writes. “The momentum of his fist connecting with my head sent us both crashing to the ice. We were both tangled up, and we went down head first and we landed face-to-face.” Kocur asked if McCarty was okay. “Thanks for not killing me, Mr. Kocur,” McCarty said. The late Bob Probert was another of Kocur’s belligerent teammates with Detroit. Look him up at the Hockey Hall of Fame’s online register of NHL players and the potted biography they have on file takes a fairly straightforward run at his legacy: one of the most feared enforcers in the NHL, it alleges, says he could have been another Mark Messier but for having been groomed to lean more toward fisticuffs than toward the development of his playing skills and so is most remembered for punching a wide swath across the NHL. Kocur’s profile is, on the other hand, strangely muted. He was a hard-nosed right-winger who was a good checker and intimidating presence on the ice. Also: better at handling the puck than most people realized with a deceptively hard shot. Kocur played 15 seasons in the NHL, retiring in 1999. He won three Stanley Cups as a player, another one as an assistant coach in Detroit. He was mostly a Red Wing, though he also skated for the New York Rangers and, briefly, the Vancouver Canucks. He scored some goals — 80 in 821 regular-season games, another 10 in his 118 playoff games — but that’s not, again, where he got his renown. Dropping the gloves was a thing he did well, freeing up his bare fists in order throw them at those heads, helmeted or otherwise, that needed punching. 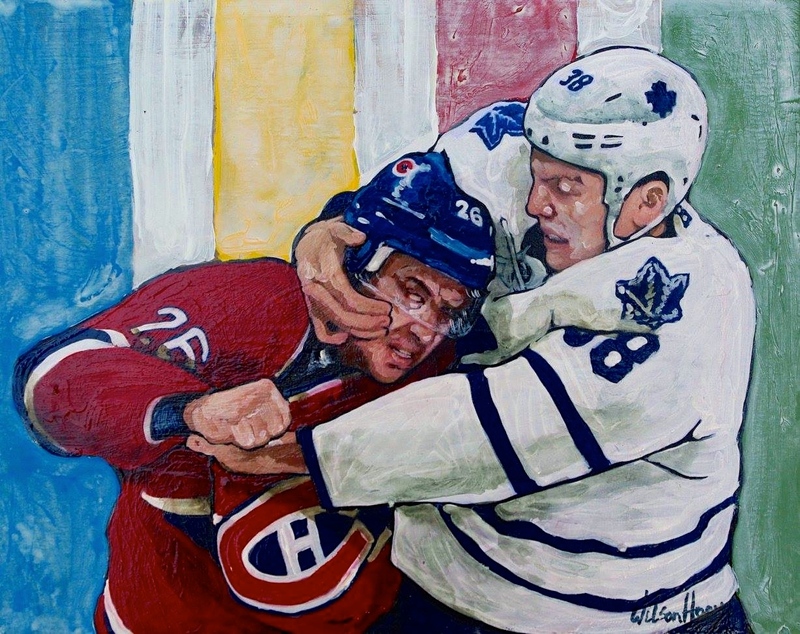 From the ruthless efficient and generally dispiriting tables at Hockeyfights.com, I know that he did that — punching heads — in at least 218 altercations over the course of his career. I’d assumed that the internet’s hockey-punching headquarters would be able to help with some other numbers I was interested in: how many concussions did Kocur sustain along his painful way, and how many did he administer to others? But for some reason, Hockeyfights.com (powered by Violent Gentlemen) doesn’t track head trauma. When I typed “CTE” into the Keyword Search window, there was no delay in the answer I got: Not Found. Newspaper archives don’t have a lot to report on what all those fights did to Kocur’s head, either. Maybe he was lucky, and was never concussed. I hope so. Along the back side of Kocur’s always bloated right hand, a three-inch red scar carves a crooked path from the middle knuckle toward the wrist. Joey Kocur’s right hand resembles a map of his native Saskatchewan. That bump is his boyhood town of Kelvington. That knob is nearby Nut Mountain. That long gash could very well be the Qu’Appelle River meandering its way into Mountain Lake. Those scars might be the Quill Lakes, and those over there could be Old Wives Lake. And that large bruise could certainly be the urban sprawl of Saskatoon. He is six feet tall and weighs two hundred and ten pounds. His face is small, he has high cheekbones, a strong jaw, a gap between his front teeth, and a boyish and malevolent expression. Kocur grew up in Saskatchewan, on the Western Canadian prairie. He is of a physical type occasionally described in hockey circles as a hay baler; that is, he has the broad-back, slope-shouldered build of a farmer. On the Rangers, he occupies the position of enforcer, which obliges him to deliver the team’s response when one of its stars has been handled rudely by the opposition. Eleven seasons of hockey fights have built up sufficient scar tissue between the wrist and the knuckles that the skin there is taut and shiny and smooth. It feels like linoleum. Because of how tightly the skin is stretched, it can no longer be gathered and stitched. Here and there on his fingers and around his knuckles are dozens of small white scars, like the marbling in a piece of meat. Between the first and second knuckles is a long, thin surgical scar that was left after a tendon that had split down the middle was repaired. 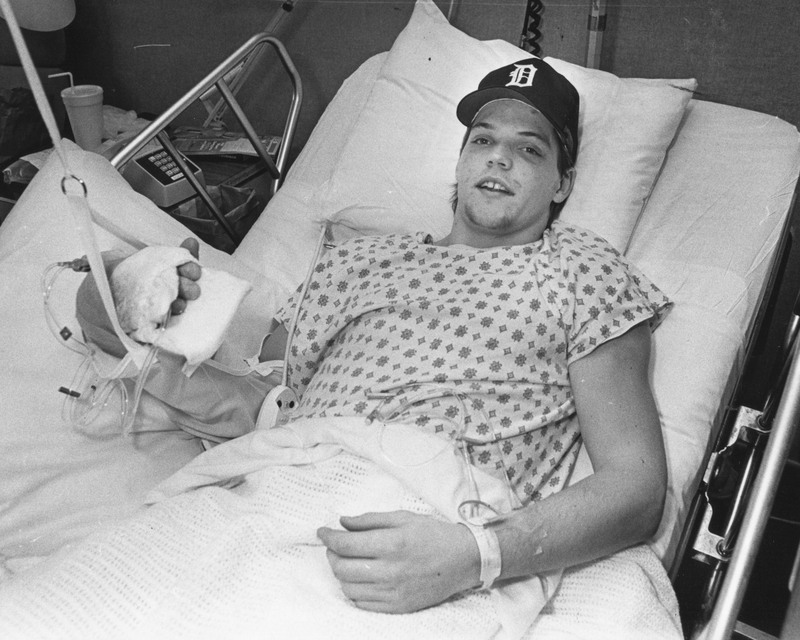 A crude, winding trenchlike scar begins between the two other knuckles and runs nearly to the wrist, the result of emergency surgery to control a staph infection. Kocur had cut his hand on another’s player’s teeth, and the doctor had stitched the wound without cleansing it thoroughly. ‘A day later, I woke up with my arm swelled to nearly the size of my leg,’ Kocur says. He split the hand open during a 1985 minor league game in Halifax, when he knocked out a six-three, two-hundred-pound Nova Scotia defenseman named Jim Playfair. In the dressing room later, a doctor needed forty stitches to close the gash. But when the rest of the team came off the ice, Kocur got some good news, too: The Red Wings had called him up to the NHL. The next morning, Kocur took the first plane out and flew all day. He checked into a hotel in Detroit, then spent an excruciating, sleepless night watching his right arm balloon to three times its normal size. When sunrise finally came, he got to the rink early for the Wings’ morning skate. But a trainer noticed the new kid was wearing only one glove. The team doctor was summoned, then a hand surgeon, too. Because doctors in Halifax didn’t realize Kocur had cut his hand on Playfair’s teeth, they sewed the wound shut, preventing it from draining and allowing infection to take hold. Just a day and a half later, the poisoned tendons and tissue between Kocur’s third and fourth knuckles had already begun to rot. When he emerged from a morphine-induced cloud two weeks after surgery, doctors explained what had happened. “If I’d waited even one more day, they might have had to amputate my whole right arm,” Kocur says. And how did that make him feel? A birthday today for Lou Fontinato, who was born in 1932, in Guelph, Ontario, whereabout he still lives. A defenceman, he was mostly, in the NHL, a New York Ranger, though he ended his career with Montreal in 1963. The on-ice activities he’s most often remembered for may be (i) leaping, which he’s supposed to have done sometimes in rage when called for a penalty and led to the nicknames Leapin’ Lou and Louie the Leaper; (ii) punching; (iii) getting punched, most famously by Gordie Howe in 1959. It wasn’t clear exactly what happened in a skirmish near the boards on the Fiftieth St. side. Maurice Richard, skating to centre ice, tossed his stick away but didn’t seem to be aiming at anybody’s head. He shoved with both hands against Fontinato’s chest, like a small boy picking a fight on the playground. The Rangers’ dark defenseman is no admirer of the Marquis of Queensberry. Strictly a London prize ring man, he had his padded gloves off the fragment of an instant. A lovely right caught Richard just outside the left eye. Skin burst and flesh cracked and blood ran in little parallel trickles down the Rocket’s face, staining his white shirt. Players and officials moved in and, to the crowd’s astonishment, Richard drew back, showing no disposition for further action. Fontinato was raging, trying to shove past officials who held him off, starting little flank movements around the knot of men who fenced him off from Richard. Pure joy swept the galleries. Crumpled papers and bits of waste were flung onto the rink. Photographers were out on the ice shooting eagerly. At length Fontinato was led to the penalty box for the second time in the evening, taking a comfortable led over Detroit’s Ted Lindsay as the league’s most penalized badman. When Fontinato hit, he hurts. He’s a 22-year-old who weighs a streamlined 191 pounds and stands 6-foot-1 — without skates. Galleryites never feel neutral toward the big bruiser. In Vancouver one time an irate fan threw his shoes at Louie the Leaper. Lou is a bachelor. So he rooms with other bachelors on the Rangers when the team is in New York. He lives with Larry Cahan, Gerry Foley and Hank Ciesla in a three-room suite at the Kimberly Hotel, 74th St. and Broadway. Each player has his chores. Lou is the cook. Does the trigger-temper explode occasionally? Howe’s most notorious altercation was with Ranger defenceman Lou Fontinato in Madison Square garden in 1959. Frank Udvari, who was the referee, recalled, “The puck had gone into the corner. Howe had collided with Eddie Shack behind the net and lost his balance. He was just getting to his feet when here’s Fontinato at my elbow, trying to get at him. ‘I want him,’ he said. ‘Leave him alone, use your head,’ I said. 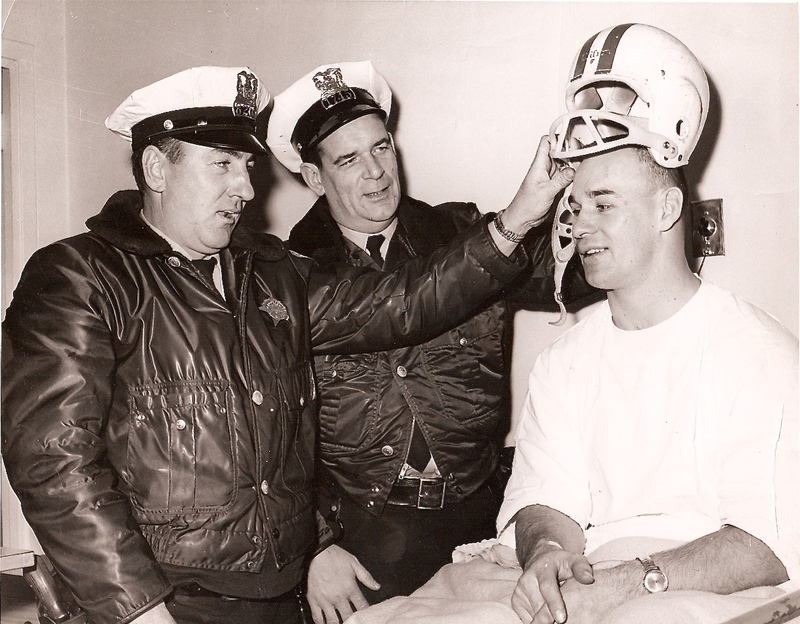 Howe broke Fontinato’s nose, fractured his cheekbone, and knocked out several teeth. Plastic surgeons had to reconstruct his face. 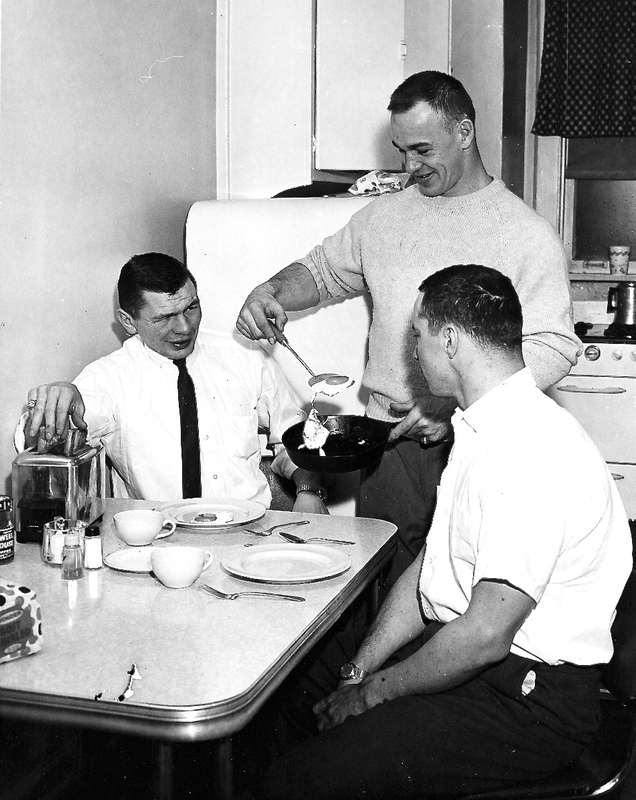 That’s the feeling around the NHL — an unwritten rule — you don’t fool around with big Gordie. 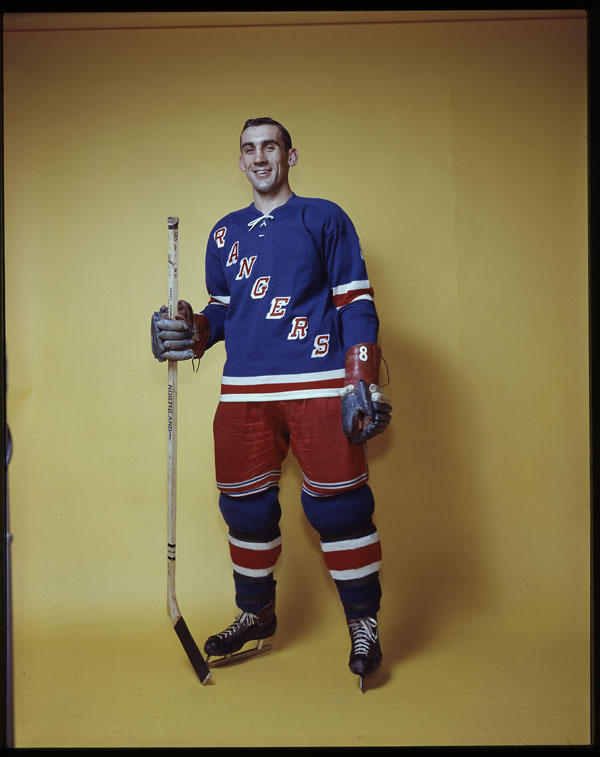 Lou Fontinato learned the hard way, one night in New York when the former tough guy of the Rangers tangled with Howe behind a net. “I still hear that sound,” one of Fontinato’s former team-mates said recently. “I was only a few feet away. Gordie had his skates braced against the back of the net and he threw only one punch. It was the worst thing I’ve seen in hockey. It broke Louie’s nose, knocked him cold.